New Delhi: The staccato roar of Formula One (F1) cars in full throttle reverberated around Greater Noida’s Buddh International Circuit as the first practice session got under way on Friday for Sunday’s inaugural Indian Grand Prix. For most of the 24 drivers, it was their first experience of the tarmac at F1’s newest course. Sahara Force India had the honour of being the first out of the pit lanes, with Adrian Sutil at the wheel of the leading car. Minor aerodynamic upgrades have been made to the team’s cars and Sutil was happy with the results. “The upgraded car felt really good, it had great stability," Sutil said. “The track has a very high grip, which always makes it better for the drivers. We’ll be willing to be more adventurous." Sutil, who finished eighth in the first practice session and seventh in the second, picked the corners heading into and out of the long straight, the second longest in the world at 1.2km, as the best places to overtake. “Turn three is very important because you have to get the exit exactly right so you can get maximum speed on the straight," Sutil said. “Then you have to brake quite hard going into turn four, so that will be a very interesting place to try and overtake." “I was very emotional, lots of things going through my head in the first few laps," Karthikeyan said. “But now I’m quite focused on the qualifying (session)." Karthikeyan’s excitement was shared by the other Indian driver in F1, Team Lotus’ Karun Chandhok, who was part of the morning practice session, even though he will not be racing in the main event. “It was just so enjoyable," Chandhok said. “It’s actually a bit faster than what we thought. The predicted average lap time on the simulator was 1 minute 27 seconds, but the guys at the front finished in 1:25, which means they will probably finish it in 1:23 in qualifying." Scuderia Ferrari’s Felipe Massa recorded the best lap time, 1:25:706, during his 33-lap run in the second practice session. Massa’s teammate Fernando Alonso provided the early drama, when his engine failed in the morning practice session. Massa managed to steer his car into a run-off area, exited the car visibly upset, and sat down below a huge screen that was showing a replay of his engine failure. “I lost the entire morning session, but fortunately I was able to run without any problems in the afternoon," Massa said. “I like the track, even if it is very dirty, and if you go the slightest bit off line, it’s like driving on ice. 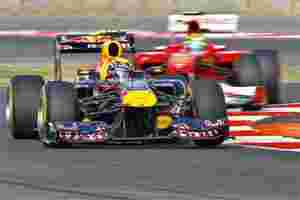 This could create problems during overtaking moves on Sunday." McLaren-Mercedes driver Jenson Button, who won the driver’s championship in 2009, compared the track with Istanbul Park, the venue of the Turkish GP. “It’s got the same feel as Turkey and apart from the dust, the asphalt felt pretty good; the track’s got a good flow to it," Button said. “It’s a bit tricky, too, the chicanes (a series of quick turns in the road) are quite tight, and we saw some cars spinning off, so you have to pick the right line, otherwise it can throw you off." Invaluable lessons for the qualifying session on Saturday, which will decide the starting grid for the main race on Sunday.